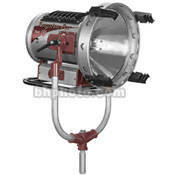 The Mole Richardson 5K Tungsten PAR is based on the design of the widely popular Daylite HMI PARS. The combination of the high-efficiency parabolic reflector and axial (on its side) orientation of the conventional tungsten lamp yields a fixture with performance of more than twice its nominal wattage. Optional lenses are available to narrow or “flood-out” the luminaries’ beam of light, while a knob on the back of the housing offers fine adjustment within the beam parameters of the selected lens. The 120/240V fixture features a hinged, locking front door for quick lamp change as well as a 1 1/8″ (28 mm) “junior” receiver and stainless steel safety screen. Variable accessory clip positions can be located at either 90° or 45°. Also included is an attached 25′ Type SO, 3 conductor #12 AWG (no plug). The head accepts Mole 13 1/2″ (34.2 cm) accessories.